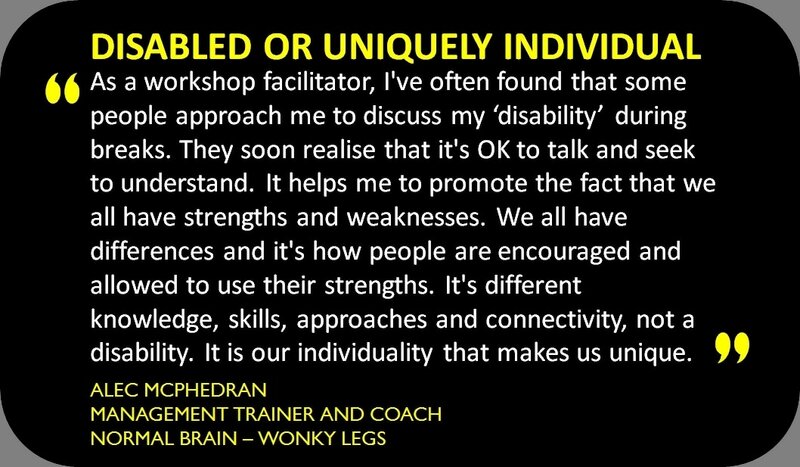 One of the things we have recently began doing a little more is specialising in using trainers, coaches and facilitators who have a registered disability. This has been great in delivering regular management or leadership events within an organisation but it has been equally as useful in raising awareness of the value and capability of people with disability. If you are keen to help build on your employees businesses or personal kills and at the same time show that disability is not an issue or barrier through using trainers, coaches or facilitators with a disability, then do talk to us. Call 0121 366 87 99 to see what ideas we can come up with. Alec McPhedran shares his experiences of delivering workshops from a wheelchair. We can also help people in your organisation understand how to approach and work with people with disabilities. When you call us, we will discuss your specific company needs and together develop an initial framework of training and support for your people. Once agreed, we then connect you to a disability specialist to make sure we have the right person for your company. When everyone is happy, we can then proceed with raising awareness and developing your peoples understanding. We can also provide you with mystery customer surveys. We visit your premises and compile a report covering access, empathy, support, understanding, ease of facilities, special requests and attitude towards disabled customers. For more information, give us a call on 0121 366 87 99 to explore opportunities to enhance your connectivity with others. We helped a group of architects understand the challenges of using a wheelchair. Spending time in a wheelchair certainly opened their eyes to their impact on others. In the afternoon we had a fantastic brainstorming session on how they could make life that little bit easier for wheelchair users. The UK Government is really keen to make sure employers can make the best of utilising skills from people with disabilities. On that basis, the Disability Confident initiative as a great tool to remove barriers between employers and disability. Succeeding in business is your top priority. So finding the best people is essential. Over 7 million people (17.5%) of working age in the UK are disabled or have a health condition. You can become Disability Confident by recruiting and retaining disabled people and people with health conditions for their skills and talent. Being Disability Confident could help you discover someone your business just can’t do without. To learn more about the Disability Confident scheme, click on the button below.